(Includes Luncheon & Coffee, Tea & Soft Drink)Multiple Workshop Discount applies to those signed up AND paid at the same time in one full payment by one Check or Credit Card. Four days prior to workshop. 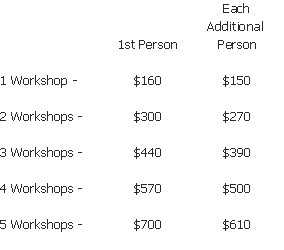 Late registration fee is $170.00. You may cancel up to four days before a class to receive a refund less 20% as a cancellation fee. Cancelling less than four days before a class will result in no refund. You may switch to another class date or change attendee’s name at no charge four days prior to class. After four days before class there will be a 20% additional charge to switch classes or an attendee’s name.